Craig Alexander ranks among triathlon’s greatest champions. Racing his first triathlon at the age of 22, he has since achieved excellence in every aspect of the triathlon way of life, winning an impressive number of championships along the way. His record breaking feats include being the first man to win both the Half Ironman and Ironman World Championships in the same year. Thinkun were asked to work with the team behind Craig Alexander to help create a moving brand experience for Craig’s supporters, triathlon fans and sport lovers. The desired outcomes was to create a sustainable brand and website that would grow with Craig as he approaches 40 and looks to retiring from the sport and focusing on other endeavours in the coming years. Our challenge included creating a strong online brand presence for Craig that would capitalize on his current greatness while also providing a means for keeping his legacy going once he stops competing, with the additional benefit of generating revenue possibilities for him in years to come. By providing a platform for connecting with arguably the fittest man on the planet, the site would be a resource for people aspiring to better health and fitness, incorporating eCommerce, product affiliate and advertising capabilities. The brand objectives were to extend awareness of Craig beyond the current Ironman/Triathlete audience by capturing the qualities that make Craig such an outstanding athlete, one who helps others in achieving better health, fitness and lifestyle choices. Working with Craig and his team, we were able to define the central theme of Craig’s brand as one of perseverance and strength. We created a visual identity that symbolised the values central to Craig’s success as an elite athlete. The CA infinity curve captures both the triathlon course and Craig’s capacity for endurance even in the most gruelling of races. Craig is often known by his moniker ‘Crowie’, which we felt was a fitting name for the brand given Craig’s humility, even in the face of great successes. 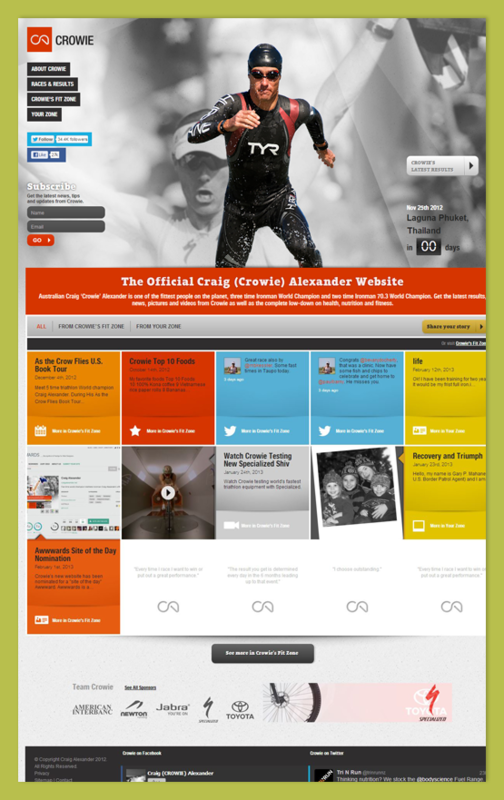 This brand identity was then further developed into an online platform designed to allow fans to connect with Craig and contribute to the wider discussion of not just triathlon but heath, nutrition and fitness. We introduced a vibrant colour palette and interactive features that reflected Craig’s brand. The visual and tonal feel of the website was designed to convey the sense of dynamism that Craig brings to his life and the sport he loves. His personal ethos of staying fit is captured in an interactive grid of stories collected under “Crowie’s Fit Zone”. This is a comprehensive section chronicling Craig’s Ironman training, healthy living tips, upcoming news and events and his Top 10 personal recommendations for products and services. The responsive web design allows the tiles of the pages to configure automatically for different monitor screen sizes. Content is organised into categories and tags which enables filtering by topic as well as allowing users to discover content by introducing related content within each story item. This visual nature of content delivery ensures increased engagement and results in more time spent on the site. 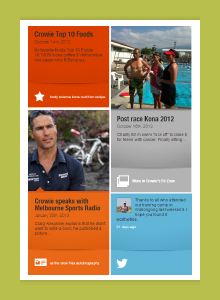 User contributed stories of their own fitness, health and charity endeavours have a corresponding section entitled “Your Zone”, the name tie in with “Crowie’s Fit Zone” further makes the connection between Craig and his audience. Positioning Craig Alexander as a professional, hard-working, elite athlete helped us orient the brand, which is rooted in purpose driven health, fitness and lifestyle choices. 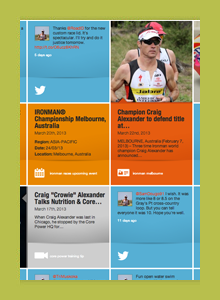 Bringing Crowie’s brand to life also meant positioning him as a sports/health for life advocate, and not just a resource for competing in triathlons. 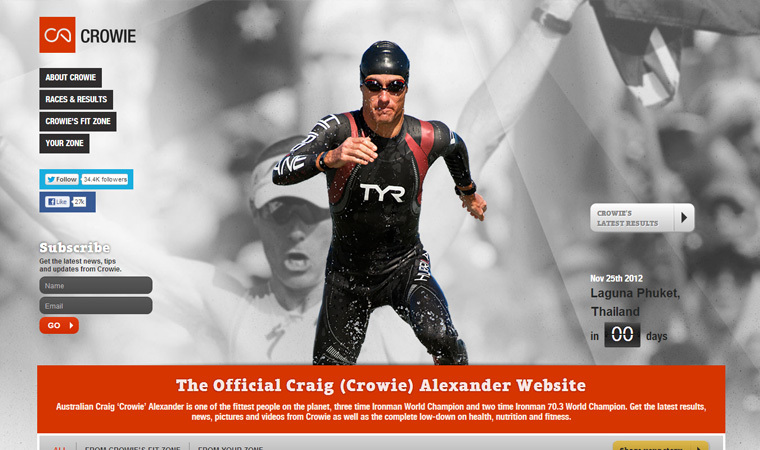 The Crowie’s Fit Zone was created to be a space where Craig’s could share personal insights, endeavours and expertise. 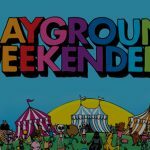 Additionally the Your Zone space was created to allow a community of contributors to share their stories of self improvement and athletic achievements. The interactive tiles allows users to filter by topics, bring their particular interests to the forefront. These separate yet related stories bring together Craig’s driving passions of health, nutrition and fitness, while making it easier to communicate to audiences of all kinds. By creating a flexible yet strong brand, we helped Craig branch out into new online territory while strengthening his core values. In doing so, it also ensured that the brand would have the longevity to carry Craig’s legacy in years to come.